Is there a place where concrete should not be?! Hmmm, don’t think so. 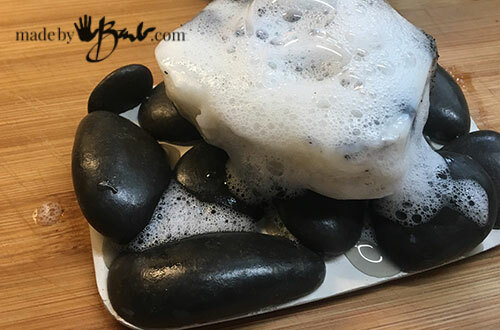 My rustic scrubby soap was asking to have a place to rest and dry between uses. 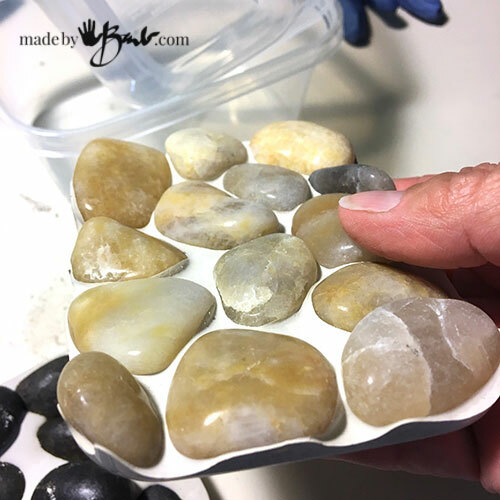 ‘Time for a super simple quick project… Make your soap happy with this Easy Rock Soap Dish. 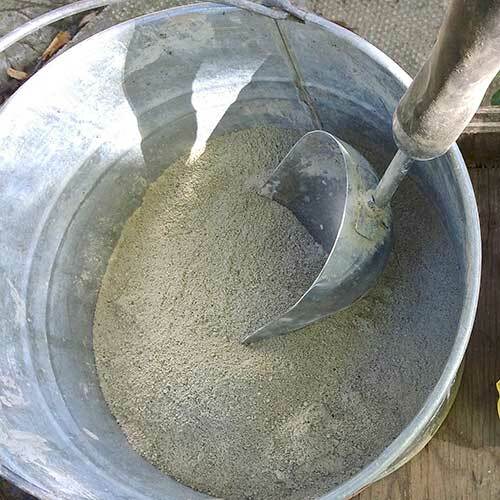 If you have ever mixed any concrete before then is the easiest project ever! The hardest part may be to find a suitable mold. 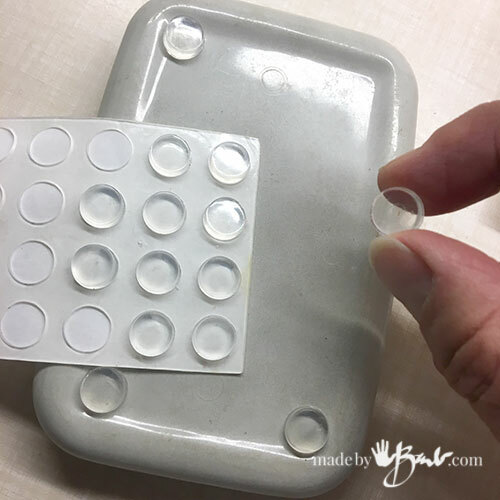 I had kept my eye out for a plastic container that was of a size and shape for a bar of soap. There are many options of the ‘Tupperware’ (brandname) products nowadays, especially at dollar stores. They are usually quite rounded and have a concave bottom as well. 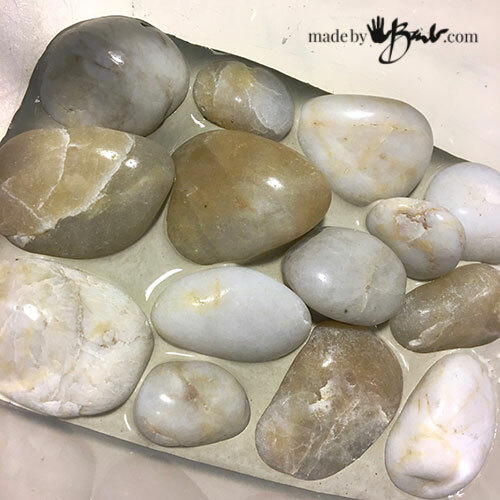 I like the polished stones as they are easy to find in most craft and dollar stores, but any stones could work. Considering that you will want to clean it the shiny polished ones or glass would be easier. 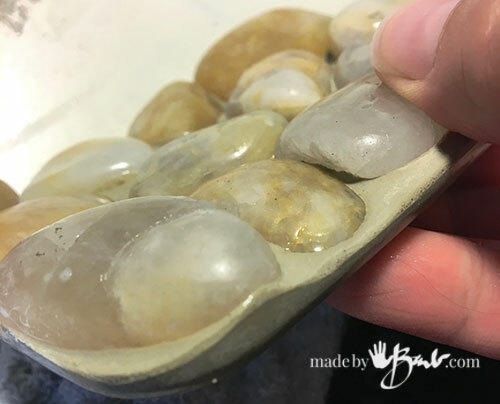 To get an idea of the amount of stones and placement I do a ‘dry-fit’ test. Figuring out the layout before getting them covered in concrete is better. 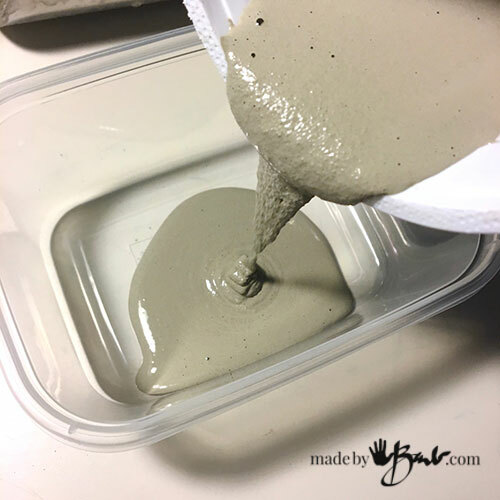 Mix a quite fluid consistency of the Rapidset Cementall and pour into the bottom being careful to keep the edges neat. 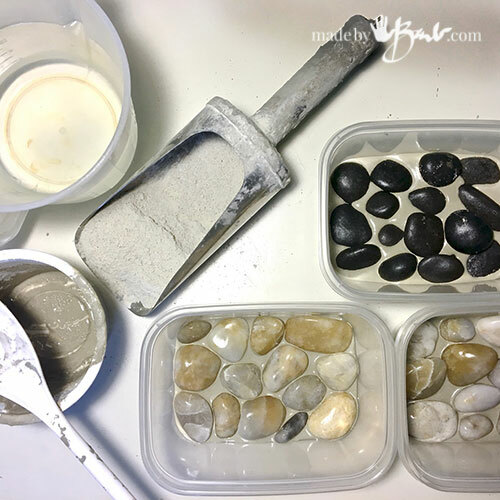 The first one I made ended up having too much concrete; since the stones displace some of the mix it got quite deep as stones were added. The new plastic is so shiny that it will easily release the concrete; no release agent needed. 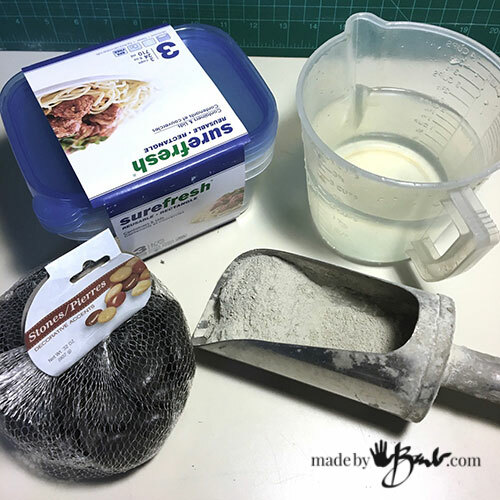 Pour enough mix into the bottom to flow to all the edges and about 3/16″ or so thick. It will depend on your mold shape as well. 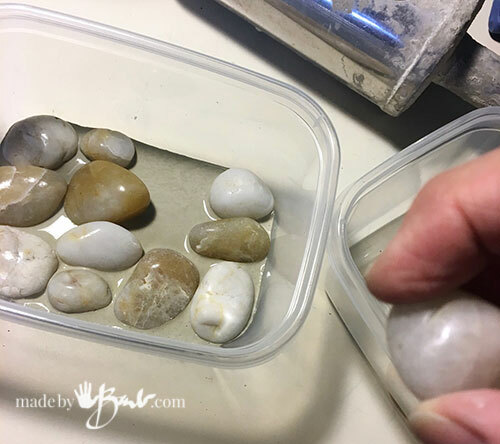 Move the stones from ‘the dry-fit’ container to the fresh concrete in approximate same placement one-by-one carefully as you don’t want to have to move them around. All the charm comes from stones as the concrete just gives them a sturdy base. After an hour they can be popped out! 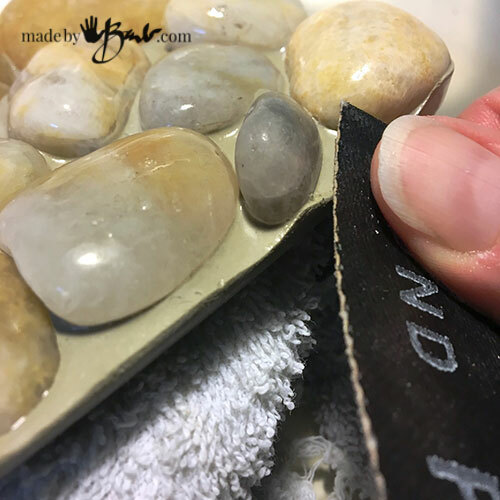 Check edges when unmolding for any sharp parts. It usually flows quite nicely when thin so it finishes well. If needed use some strong emery cloth early on to sand off the sharp parts. (wet sanding will eliminate dust) It will be super hard after 24 hours. Nicely rounded and washed. Sealer just complicates things, and this concrete is so very dense that it is not porous. Yes, that’s how shiny the finish of this concrete mix is! No polishing was done. Depending on where you would like to use it you may want to protect your surface. Self adhesive felt or rubber pads work well. The surface of the dish is flat so it will not gather water, but make it flow off and the stones keep the soap elevated from the wet surface; so keep that in mind when placing it. There are many options of what you can use. Marbles will work as well. 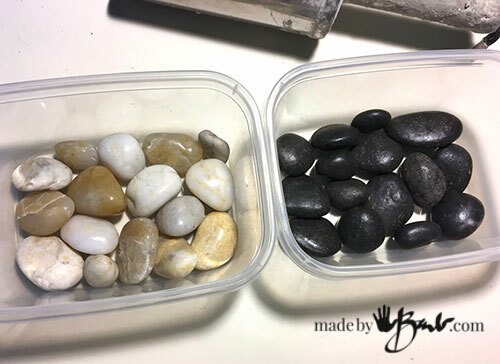 Beach glass or rounded pebbles all work well in a wet environment. 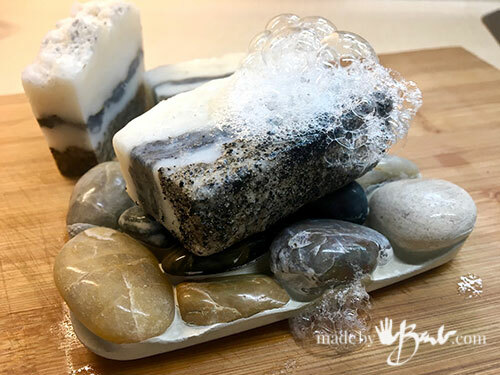 Handmade soap does not have all the extra ingredients such as hardeners or fillers so they tend to get soggy if left in a wet dish. Your soap will thank you! 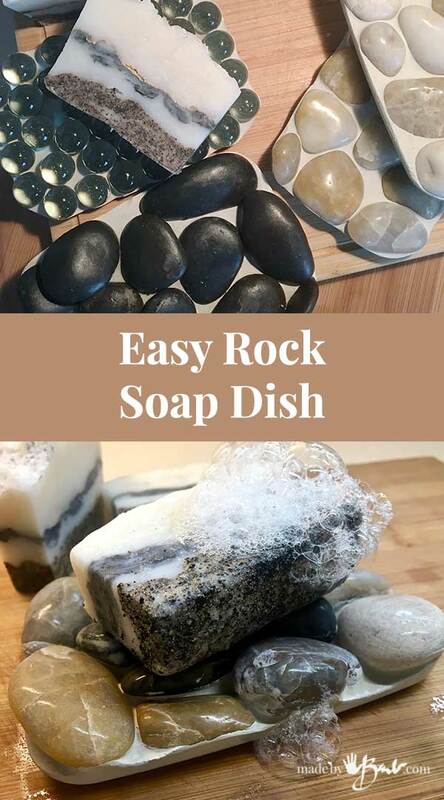 Go make some soap as gifts and couple it with a sweet Easy Rock Soap Dish! 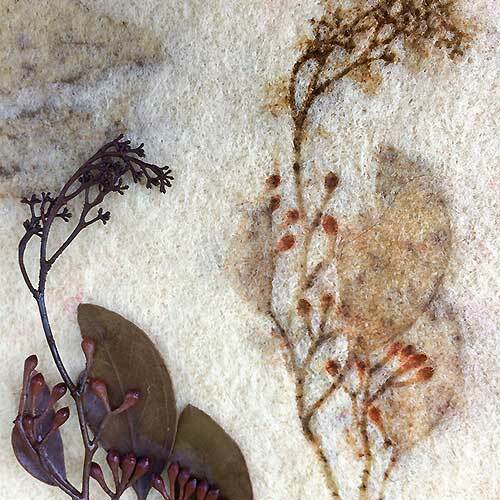 If you shudder to think about working with concrete check my tips here. Happy making! Oh, just a thought… This method could also make other trivets to elevate other things like plants etc. There are so many variable options of what you can use. Marbles, as an option, will work as well. I have been looking at your posts on Pinterest. I really like your concrete molds. If you could send me some of your work.? 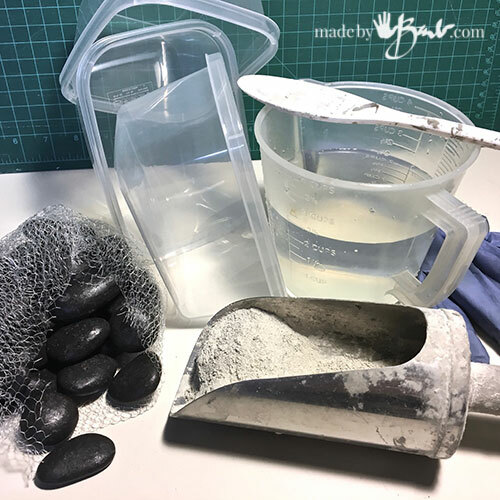 Shipping is so expensive… They are easy to make and there are many easy concrete projects Start slow and see here to get some tips. Have fun! 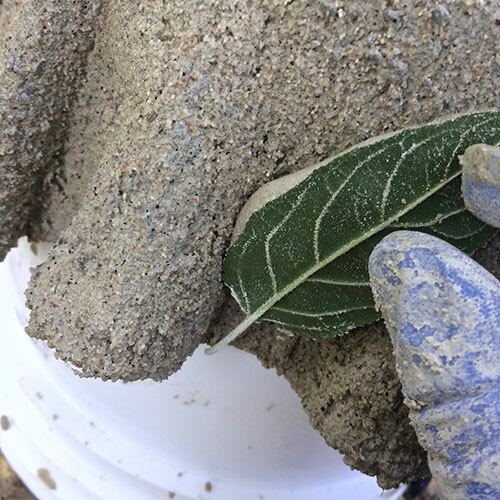 If someone could help…Will any rapid setting cement work such as rapid setting tile mortar? I love this idea! Question, can you reuse the mold and if so will it be a shiny and pop out? Or do you need a releasing agent? If so what is a typical releasing agent? I’m totally new to pouring cement but am in awe of it! I don’t like to use a release agent since it would build up ‘guck’ in the mold. It will eventually lose some of the shininess after a few uses but they are quite cheap at the dollar store. If you are new you may benefit from this Be safe and have fun! Oh, it is an amazing idea! I love creative people. 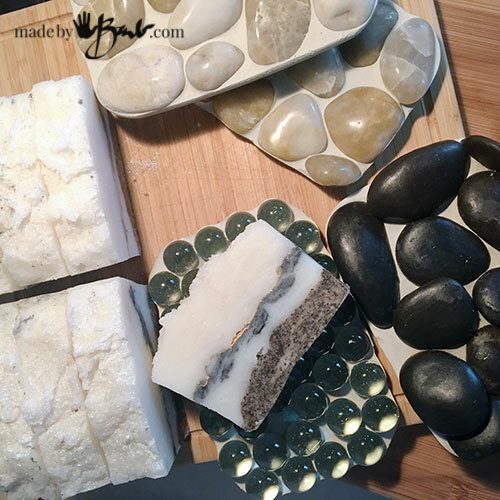 Handmade soap is a good present for your friends or family. I want to make these things. It is the easiest way to make our life brighter. Create exciting moments! Creativity is good on so many levels! Gifting it one! And I have not bought soap in years! Oh, it is an amazing idea! I love creative people who makes our life brighter. I think handmade is a good present for me and my family. Create for yourself exciting moments! Giving a handmade gift is like giving a tiny piece of yourself… That is why selling is so hard.